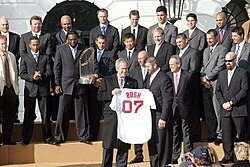 The 2007 World Series was the championship series of Major League Baseball's (MLB) 2007 season. The 103rd edition of the World Series, it was a best-of-seven playoff between the National League (NL) champion Colorado Rockies and the American League (AL) champion Boston Red Sox; the Red Sox swept the Rockies in four games. It was the Rockies' first appearance in a World Series. The Red Sox's victory was their second World Series championship in four seasons and their seventh overall; it also marked the third sweep in four years by the AL champions. The series began on Wednesday, October 24 and ended on Sunday, October 28. Terry Francona became the second Red Sox manager to win two World Series titles, following Bill Carrigan, who won the 1915 and 1916 World Series. Including the last three games of the AL Championship Series, the Red Sox outscored their opposition 59–15 over their final seven games. Francona also became the first manager to win his first 8 World Series games. The Rockies, meanwhile, became the first NL team to get swept in a World Series after sweeping the League Championship Series, and just the second team ever to suffer such a fate, following the Oakland Athletics in 1990. This fate would again be suffered by the 2012 Detroit Tigers, being swept by the San Francisco Giants in the World Series after sweeping the New York Yankees in the ALCS. The Red Sox cruised to a blowout win in Game 1 behind ALCS MVP Josh Beckett, who struck out nine batters, including the first four he faced, over seven innings en route to his fourth win of the 2007 postseason (and the sixth of his career). Mike Timlin and Éric Gagné pitched a perfect eighth and ninth, respectively. Boston Hall of Famer Carl Yastrzemski threw the ceremonial first pitch, as he had done before Game 1 in 2004. Rookie Dustin Pedroia led off the Sox' first inning with a home run over the Green Monster in Fenway Park off of Jeff Francis. Pedroia's homer was only the second lead-off home run to start a World Series (the only other one was hit by Baltimore's Don Buford in 1969). Kevin Youkilis then doubled to right, moved to third on David Ortiz's groundout, and scored on Manny Ramirez's single. After Mike Lowell flew out, Jason Varitek singled before J. D. Drew doubled to score Ramirez and make it 3-0 Red Sox. The Rockies got on the board in the second when Garrett Atkins doubled with one out off Beckett and scored on Troy Tulowitzki's double one out later, but the Red Sox got that run back off of Francis when Youkilis walked with two outs and scored on Ortiz's double. In the fourth, the Red Sox loaded the bases with two outs on a single, double, and intentional walk when Varitek's two-run double put them up 6-1. Though Herges and two relievers held Boston scoreless for the rest of the game, the Red Sox finished with thirteen runs, the most ever in a World Series Game 1, and tied another record with nine extra base hits. The last 11 of the Red Sox runs came with two outs. The ceremonial first pitch was thrown by Andrew Madden, a 13-year-old heart transplant recipient, accompanied by Boston Red Sox Hall of Fame member Dwight Evans. After the debacle of Game 1, Colorado appeared to return to form, scoring quickly on a groundout by Todd Helton with runners on second and third in the first. However, this would be the only time the Rockies ever led in the series as postseason veteran Curt Schilling (​5 1⁄3 IP, one run, four hits) and Boston's bullpen (Okajima, ​2 1⁄3 IP; Papelbon, ​1 1⁄3 IP) allowed no other runs in the contest. The Red Sox tied the game in the fourth off of Ubaldo Jimenez on Jason Varitek's sacrifice fly with runners on second and third, then took the lead next inning on Mike Lowell's RBI double with runners on first and second. Matt Holliday had four of Colorado's five hits in Game 2, including a base hit off Papelbon with two outs in the eighth. Before throwing another pitch, Papelbon caught Holliday leaning too far off first base and picked him off—Papelbon's first career pickoff. This was the first World Series game ever played in Colorado. At 4 hours 19 minutes, it became the longest nine-inning game in World Series history until game five of 2017. Game 3 was also the 600th World Series game ever played. Starting pitcher Daisuke Matsuzaka pitched five innings of scoreless ball and left in the sixth with no runs allowed. The Red Sox struck first with a six-run third inning. Rookie Jacoby Ellsbury hit a leadoff double, moved to third on Dustin Pedroia's single, and scored on David Ortiz's double. After Manny Ramirez was intentionally walked, Mike Lowell's single scored two more runs. J. D. Drew popped out before Ramirez was thrown out at home on Jason Varitek's single with Lowell advancing to third. After Julio Lugo walked to load the bases, Matsuzaka hit a two-run single for his first base hit and RBI in the Major Leagues. Ellsbury capped the scoring with his second double of the inning to knock Colorado starter Josh Fogg out of the game. The Rockies' bats came to life in the sixth and seventh innings against a normally-solid but now-shaky Boston bullpen. After Matsuzaka walked two straight in the sixth with one out, reliever Javier López allowed back-to-back RBI singles to Brad Hawpe and Yorvit Torrealba. Mike Timlin allowed two straight leadoff singles in the seventh before NLCS MVP Matt Holliday brought the Rockies to within one run with a three-run home run off Hideki Okajima. Brian Fuentes gave back those runs in the eighth by walking Lugo with one out and allowing a subsequent single to Coco Crisp before Ellsbury and Dustin Pedroia, who had four and three hits, respectively, on the night (the first time in World Series history two rookies had at least three hits in a game) hit back-to-back RBI doubles, raising Boston's lead to 9–5. Jonathan Papelbon came on for a four-out save, getting Holliday to fly out on one pitch, leaving runners on first and second. Jason Varitek would tack on Boston's tenth run in the top of the ninth off of LaTroy Hawkins with a sacrifice fly, scoring Mike Lowell who, not generally considered a stolen base threat, had just stolen third base--the first time a Red Sox baserunner stole third base in the World Series since 1975--after hitting a leadoff single and moving to second on a sacrifice bunt. Papelbon came back out in the bottom of the ninth to complete the save, getting the first two outs before surrendering a two-out triple to Brad Hawpe, then finishing the game with a groundout from Yorvit Torrealba. The Red Sox took Game 3 by a final score of 10–5. The Red Sox struck early. Rookie Jacoby Ellsbury began the first inning with a double and was advanced by Dustin Pedroia with a groundout, followed by an RBI single from David Ortiz. In the seventh inning, series MVP Mike Lowell hit a home run to give Boston a 3–0 lead and knock starter Aaron Cook out of the game. Lowell also hit a leadoff double in the fifth and scored on Jason Varitek's single. The Colorado offense answered when left fielder Brad Hawpe hit a home run off of a Manny Delcarmen fastball, bringing the Rockies within two. Relief pitcher Brian Fuentes gave back that run abruptly, allowing Boston pinch-hitter Bobby Kielty to hit a ball into the left field stands on the first pitch of the inning, extending the Red Sox lead to 4–1. In the bottom of the inning Boston pitcher Hideki Okajima allowed a one-out single to Todd Helton followed by a Garrett Atkins two-run home run, bringing the Rockies within one. Jonathan Papelbon relieved Okajima and earned his third save of the series. At 12:06 a.m. EDT on Monday, October 29, Papelbon struck out Colorado pinch hitter Seth Smith for the final out of the 2007 World Series. Boston had won its second World Series title in four years and seventh all-time. The Rockies became the third team in Series history (the 1937 Yankees and 1966 Orioles were the others) not to commit an error in a World Series of any length. The Rockies organization said that they were the victims of a denial-of-service attack. The FBI started its own investigation into these claims. Ticket sales resumed the next day, with all three home games selling out within ​2 1⁄2 hours. The Red Sox World Series win in 2007 continued the success of Boston-area teams in recent years. The Celtics won their 17th championship, their first championship since 1986, the last time the Red Sox lost in the World Series, ​7 1⁄2 months later. Furthermore, the New England Patriots had victories in 2001, 2003, 2004, 2014, 2016 and 2018, the Boston Bruins in 2011, and the Red Sox three years earlier in 2004 and six years later in 2013 and five years after that in 2018. Game over, series over, and the Red Sox are world champs again. The World Series was televised by Fox in the United States, with Joe Buck and Tim McCarver as booth announcers. The starting time for each television broadcast was 8:00 pm EDT (6:00 pm MDT). The series broke with the recent tradition of starting the World Series on a Saturday, as Major League Baseball had become convinced that weekend games drew lower television ratings. Prior to this season, every World Series since 1985 had opened on a Saturday, with the exception of the 1990 World Series. This was the first World Series to start on a Wednesday since 1968. ^ "Montague to head World Series crew". MLB.com. October 23, 2007. Archived from the original on October 30, 2007. Retrieved October 23, 2007. ^ "2007 World Series". Baseball-Reference. Retrieved January 6, 2014. ^ Bloom, Barry M. (October 25, 2006). "MLB, union announce new labor deal". MLB.com. Retrieved October 30, 2007. ^ "2007 World Series Game 1 - Colorado Rockies vs. Boston Red Sox". Retrosheet. Retrieved September 13, 2009. ^ "2007 World Series Game 2 - Colorado Rockies vs. Boston Red Sox". Retrosheet. Retrieved September 13, 2009. ^ "2007 World Series Game 3 - Boston Red Sox vs. Colorado Rockies". Retrosheet. Retrieved September 13, 2009. 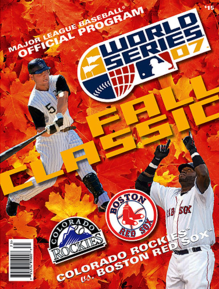 ^ "2007 World Series Game 4 - Boston Red Sox vs. Colorado Rockies". Retrosheet. Retrieved September 13, 2009. ^ Caron, Tom (August 26, 2014). "Yaz was a man of the people". Portland Press Herald. Retrieved October 21, 2018. ^ Cafardo, Nick (October 26, 2007). "Throwing 1st pitch a dream come true for heart patient". The Boston Globe. Retrieved October 21, 2018 – via Boston.com. ^ "Rockies announce change to World Series ticket policy" (Press release). Colorado Rockies. October 17, 2007. Archived from the original on October 27, 2007. Retrieved October 30, 2007. ^ "Club statement regarding World Series tickets" (Press release). Colorado Rockies. October 17, 2007. Archived from the original on October 23, 2007. Retrieved October 22, 2007. ^ "Rockies sell out World Series tickets day after 'malicious attack'". CBS Sports. October 23, 2007. Archived from the original on October 31, 2007. Retrieved October 30, 2007. ^ "FBI investigates Rockies ticket 'attack'". Vail (Colo.) Daily. October 26, 2007. Retrieved January 6, 2018. ^ Mohl, Bruce (October 23, 2007). "This time, the tickets cost a smaller fortune". Boston Globe. Archived from the original on July 27, 2008. Retrieved October 30, 2007. ^ Cook, Robert M. (October 28, 2007). "Sox fans save big bucks by heading to Denver to see the World Series". Foster's Daily Democrat. Archived from the original on October 29, 2007. Retrieved October 30, 2007. ^ "At least 37 arrested during Red Sox 'celebrations'". USA Today. October 29, 2007. Archived from the original on October 30, 2007. Retrieved November 1, 2007. ^ "New Jerseyans, New Yorkers revel in Giant win". NBC Sports. Associated Press. February 3, 2008. Retrieved April 27, 2009.